This handmade iMaxi will keep your iPad clean and dry with protective wings! Haha! By Etsy seller Hiphandmaids. "With its durable vinyl outer layer and plush, quilted-cotton sleeve, the iMaxi helps keep your iPad clean and dry. Plus, the iMaxi's Velcro-latched, advanced wing design wraps snugly around your device, so your iPad always stays where it should. Best of all, it shields it from all those unsightly and embarrassing data leaks that would make any motherboard worry"
Super absorbent!! 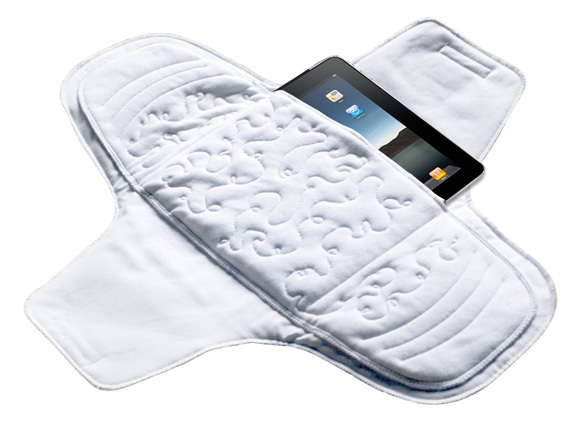 Maxi-Pad for your iPad, get yours TODAY!